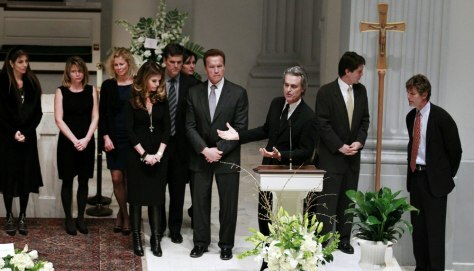 Bobby Shriver, with other members of the family behind him, speaks during the wake for his father, R. Sargent Shriver, Friday at Holy Trinity Catholic Church. The first director of the Peace Corps was brother-in-law of John F. Kennedy, Robert F. Kennedy and Ted Kennedy, and father of Maria Shriver and father-in-law of her husband, former California Gov. Arnold Schwarzenegger. Shriver died on Jan. 18 at the age of 95.